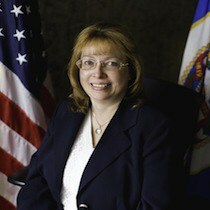 Betsy Hayes is the Chief Procurement Officer of the State of Minnesota. Betsy has 19 years of public procurement experience with the state’s Department of Administration, Materials Management Division. In her role, Betsy is responsible for directing the state’s central procurement office that acquires goods and services in excess of $4 billion annually. This includes state executive branch purchasing, as well as cooperative purchasing managed on behalf of Minnesota’s local units of government and customers from government organizations across the country. Betsy is a graduate of Cornell College in Iowa and received her J.D. from William Mitchell College of Law in St. Paul, Minnesota. Betsy is a member of the Minnesota State Bar Association and is its 2015 recipient of the Public Attorney Award of Excellence for In-House Agency Counsel.